The original gerrymander, from an 1812 political cartoon. By Elkanah Tisdale. Gerrymandering is a term in politics that many people may hear much consternation and debate about but do not really understand everything that it entails. This article will devote some time to discussing and defining the practice and also provide resources for teachers that will assist them in helping students understand what it is all about. The term has to do with how official boundaries are set within particular voting districts. The phenomenon tends to have a negative connotation. The practice of manipulating district boundaries to gain a political advantage is known as gerrymandering and the resulting district created from this practice is known as a gerrymander. It is sometime used to assist individuals from particular political, ethnic, racial, linguistic, or socioeconomic backgrounds to have more voting power. This can be done by bolstering the population of certain groups within specific district boundaries. But many times boundaries are altered to hinder minority groups from voting in certain districts. In this way, the practice is used to achieve desired electoral results for a certain political party. For example, some redrawn district boundaries can produce a voting population that is largely African-American, Hispanic or other racial minorities, creating what are known as “majority-minority districts.” Sometimes this practice is defended as the only way to secure any representation at all for certain minority groups. It is argued that violating local boundaries in drawing districts is preferable to denying a politically cohesive group any voice in state government. However, these practices are sometime used to protect incumbents. Two primary tactics are used in gerrymandering by politicians. They are cracking and packing. Cracking is the practice of weakening the voting power of an opposing political party’s supporters by diluting their presence in a district. Packing is restricting the opposing political party’s voting power to one district to weaken their voting strength elsewhere. 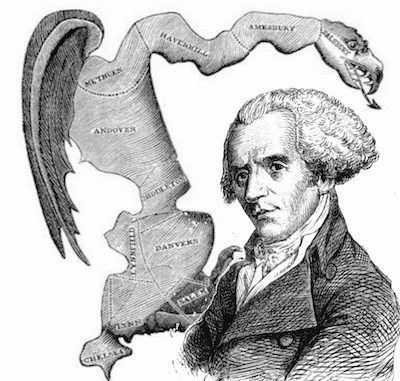 The term gerrymander was derived from the practices of former Massachusetts Governor Elbridge Gerry. Governor Gerry enacted a law in 1812 that defined new state senatorial districts. The new law pushed most of the Federalist Party voters into a few districts. This gave the Democratic-Republicans a political advantage at the polls. The shape and outline of one of these oddly drawn districts was said to resemble a salamander. Thus political cartoonist Elkanah Tisdale depicted this phenomenon satirically in the Boston Gazette, calling it “The Gerry-mander”, a term that has been in popular usage ever sense. Gerrymandering has been criticized and condemned as unconstitutional but continues to flourish as a political practice. Even today the majority parties in certain state legislatures continue to set district boundaries along partisan lines to their political advantage, disregarding the local boundaries. In some states, representatives from small town districts limit the representation of more densely populated urban centers (Which tend to be racially and ethnically diverse), by redrawing the districts. Gerrymandering: One Person one vote? Gerrymandering and Partisan Politics in the U.S.